I love acrostic poems! They are so versatile, and they are a fun way to end our series of Ramadhan activities. In an acrostic poem, you choose a main word and write it vertically, with one letter on each line. Each line of the poem then has to start with the letter that is on that line. For example, if we use the word Ramadhan, we would have each line of the poem starting with the letters R, A, M, A, D, H, A, and N.
Yes, this is considered a poem, but no, it does not have to rhyme! Each line can be a word, a sentence, a phrase, or any combination thereof. 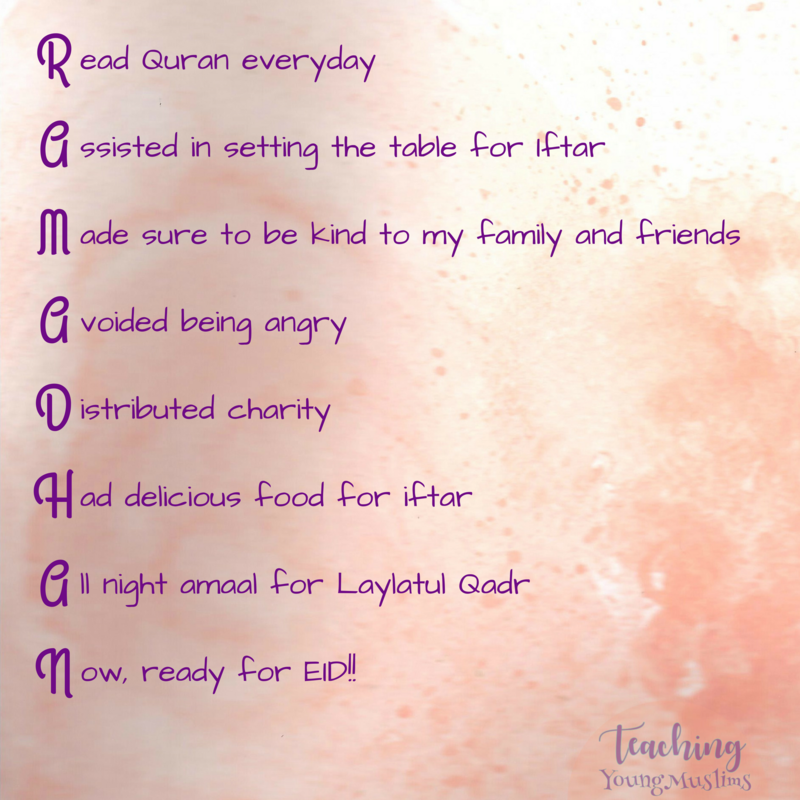 For your end-of-Ramadhan acrostic poems, you can have each kid write a poem about what they have learned this month, or what they have accomplished, or what they hope to remember from this month. They can also choose any word that they like. I love the creativity that this format allows! Every poem will be different. For my sample poem, I decided to choose the word FAST. P.S. I would LOVE to see what poems you and your kiddos come up with! Please share them with me, either in the comments section below or on the facebook page! P.P.S. 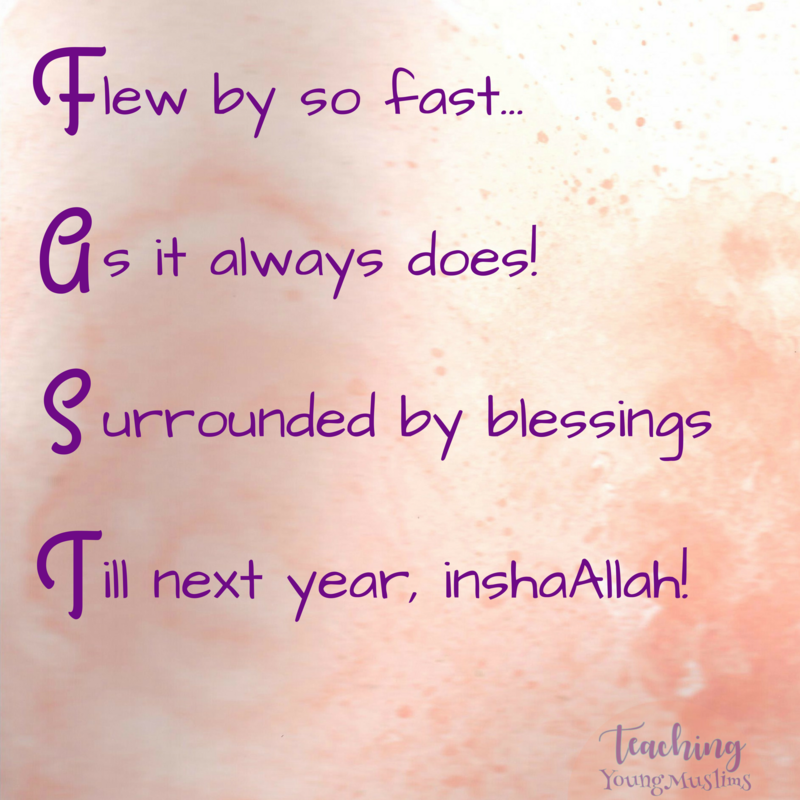 I love the way Islam from the Start used an acrostic poem to reflect on what they learned from Surah Ankaboot.